I guess you have already got a bike, you MUST have a bike in the Netherlands! But if you are anything like me, riding in the rain, hail and strong winds is a no-no. So here are a few tips about getting around Arnhem using public transport. The famous Arnhem Trolly Buses. You can see them all over town. The best and cheapest way to use public transport is to use the OV chip card (https://www.ov-chipkaart.nl/home.htm#/ ). You check in and out on the bus or at the train station. Make sure you put some money on it. At the NS ticket centre in Arnhem Central you can get all the information you need about the OV chip cards – personal with photo, anonymous, and the membership discounts. Another good way to get from A to B in Arnhem is using BRENG FLEX! It is a transport service on order, which runs from stop to stop. Which stops? You decide. What time? You decide. It`s a bit like a taxi but costs only 3,50 euro per ride. And the TRAIN of course. There is a well-developed network throughout the whole of the Netherlands and bordering countries. 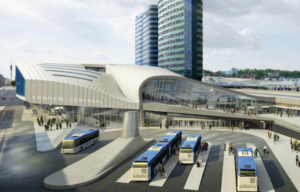 The central station in Arnhem takes a prime location in the centre and you also have stations in Arnhem South (Arnhem Zuid) and one in the north north you have Velperpoort and Presikhaaf. All the satellite towns around Arnhem are well connected via train also eg. Oosterbeek, Velp, Elst and Westervoort. Taxis in Arnhem are quite expensive. You will not find them at every corner or just standing around. There is a big taxi stand (rank) at the Central train station and at Willemsplein, or you can call and order one.